What an entertaining read! I've always enjoyed Kristen Simmons books and she continues to write stories that are very easy to sink into. 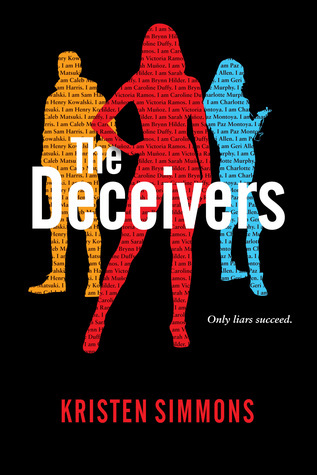 I was drawn to The Deceivers primarily because of the premise of a mysterious elite school, but what kept me glued to the pages was the heroine, Brynn. Before being recruited to Vale Hall, she had had a challenging upbringing, especially with her mother's skeevy boyfriend. She got through life by essentially scamming people and saving up for college. She was a really strong and independent young woman. I love how she pretty much took life as it came and faced every obstacle courageously. Brynn was very thoughtful and level-headed and it was fun being inside her head. When she gets recruited into Vale Hall, she finally thinks she's on track to achieve a better life for herself. But there's more to Vale Hall than meets the eye. I thought the concept was very cool. The assignments that these teens have to complete were wild and I got really invested in Brynn and her mark, a prominent senator's son. His character was interesting especially because there seemed to be so many secrets surrounding him. Speaking of secrets, I wasn't expecting some of the twists when it came to Vale Hall itself and I think there is even more to the school than we were led to believe. I'm hoping to learn more. There is also a romance in The Deceivers. It's not at the forefront of the book, but I liked the moments Brynn and Caleb shared. Caleb was a really soft boy and their slow budding romance provided a lightness to the darker tone of the book. All in all, this was a good start to this series. I'm excited to be reunited with these characters again in the future! Are you fans of books with elite/boarding school settings?